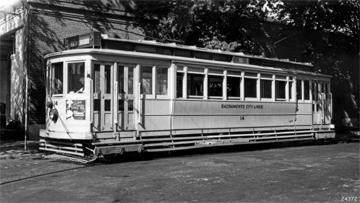 Sacramento Electric, Gas and Railway number 14 is a home-built, double-truck, wooden, California style streetcar. The car, as built, had a flat front with exposed posts. The fixed side sash is an unusual feature for Sacramento, which is known for its hot summers. 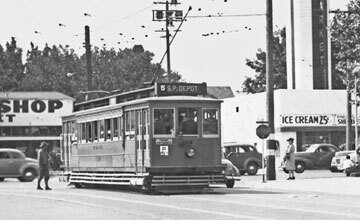 The car was built with a single centered trolley pole and base. Owners: Sacramento Electric, Gas & Railway 14. Pacific Gas & Electric. 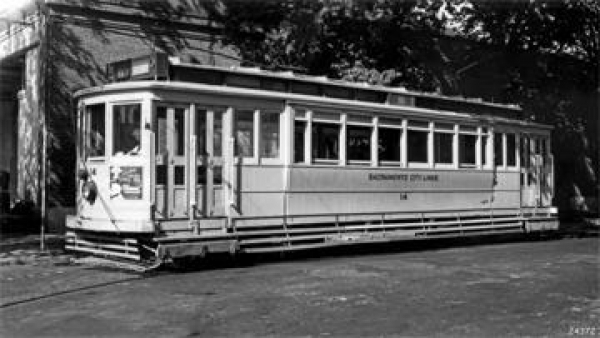 Sacramento City Lines. 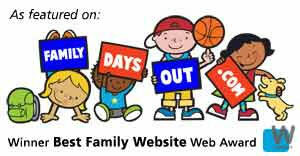 Technical Data: The car seats 44 passengers. Air Brake Equipment: Rope brakes, which is capstan on one axle, one for each direction. Dimensions: Weight was 27,000 pounds. Propulsion Equipment: Car had two 24 horsepower motors. Current Condition: Body only is in poor condition and has been covered with fiberglass. This is a simple car and could be fully restored to operating condition with appropriate resources. Proposed Future Treatment: House in covered storage until restoration to original condition is possible.